So wrote American explorer Hiram Bingham, describing the ancient wonder he’s famous for discovering in 1911 — or rather, for re-introducing to the world: the sacred Incan citadel of Machu Picchu, perched high above the cloud forests of southern Peru. I first read Bingham’s words when I myself journeyed to Machu Picchu exactly this time three years ago. Although more than a century had passed since his rediscovery — and Machu Picchu itself had been transformed from a lost city into the most visited site in all of Peru — I could still feel the “power of its spell,” just as Bingham had written. Ever-recurring surprises — can you imagine a more beautiful phrase for evoking the magic of Machu Picchu? In my latest Sleep Story for Calm, “The Trail to Machu Picchu,” I loved including a few surprises from my own journey as I walked to the ancient ruins on the Salkantay Trek. There was the striking beauty of a yellow lady’s slipper orchid growing along the path — one of hundreds of species of orchids that grow in Peru. There was the sound of running water as I walked beside an original Incan irrigation channel on our first day of the trek and tried to fully comprehend the incredible layers of history around me. And there was the dramatic shift in landscapes on our second day, as we descended from the highest point of the trail — the windblown Salkantay Pass, at 15,200 feet — and entered the humid, jungled paths of cloud forests and Amazonian rainforests. Never before had I seen — or felt — the world change so swiftly. While I shared these moments in my Sleep Story with words, today I’d like to share a few more surprises from Peru with you — moments I captured not with words but watercolors, in the sketchbook I carried with me on my journey. The first chance I had to sketch on the Salkantay trail was on our very first afternoon, once we had reached our stopping point of the day — the campsite of Soraypampa. We were told the campsite was at the base of the Humantay Glacier, though heavy cloud cover had kept the glacier concealed from us all morning. Finally, after we’d finished our lunch and an afternoon rain shower had passed, the sun came out and the clouds parted to reveal patches of a brilliant blue sky — and the steep, snowy slopes of Humantay. It wasn’t just the glacier’s sudden appearance that surprised me that first afternoon — I didn’t expect to feel so humbled and awed by its presence, as though the glacier were a living, breathing guardian watching over us. This feeling of awe and humility stayed with me through the next several days, as we journeyed from the base of the glacier to the Salkantay Pass, and from the steamy air of the cloud forests to the bustling tourist town of Aguas Calientes, where we finally arrived at Machu Picchu — and I finally had the chance to get out my sketchbook again. From the moment we walked through the main gate, rounded the path beneath the guardhouse, and glimpsed the sweeping complex of Machu Picchu for the first time, I was overwhelmed by all there was to process — so much history and significance, still shrouded in questions and mystery. And so as each hour of my day at Machu Picchu went by, I became more and more grateful for the time to sketch the ancient ruins, slowly processing the sacred city for myself — stone by stone, terrace by terrace. But the greatest surprise Machu Picchu held for me that day was still to come. Even more overwhelming than the vastness of the site was the sheer number of other people I was there with — who can measure up to 2,500 visitors a day during the high season. For the first few hours, it felt like every ancient pathway was simply a conduit for the teeming crowds, as they made their way from the main gate to the ritual stone of Intiwatana (Quechua for “hitching post of the sun”) to the Plaza Principal. And yet it was then, right after I left the Plaza Principal and began wandering through the western residential sector, that something truly unexpected happened. I turned left and right, weaving in and out of open-air rooms that had once served as homes, until I reached a part of the sector known as the Three Doorways, or Tres Portadas in Spanish. I looked around me and realized I was completely, blissfully alone. For the first time all day, it was just me and the sacred stones of Machu Picchu. 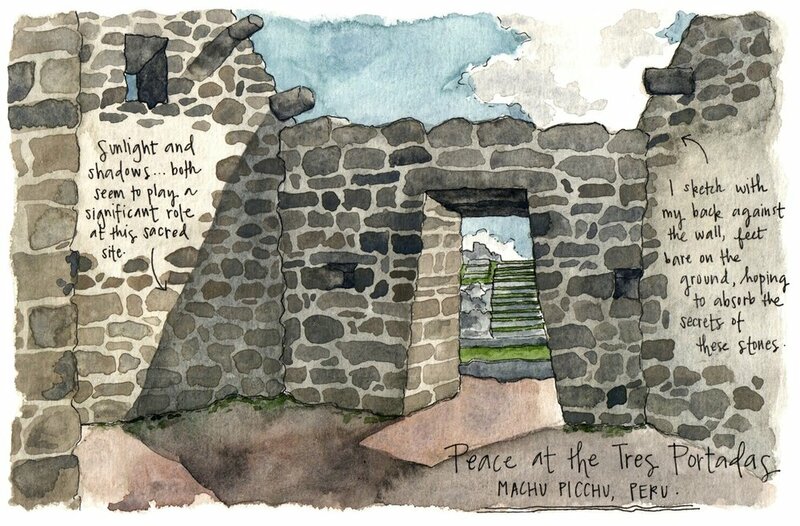 The surprising solitude I found while sketching the Three Doorways at Machu Picchu was an echo of the very same peace I’d felt on my first afternoon of the trek, as I sat humbled beneath the Humantay Glacier, in awe of its power and presence. It seems Hiram Bingham put it perfectly nearly 100 years ago — Peru’s surprises truly are “ever-recurring,” and always full of eternal echoes. Candace Rose Rardon is a sketch artist and storyteller with a passion for connecting with the world through art. She is also the founder of Moment Sketchers, an art and travel blog and global community of artists. Originally from the state of Virginia, she is now based in Montevideo, Uruguay. For more stories and sketches, follow Candace on Instagram, where she shares a new illustrated micro-story from around the world every week.